Opinions differ on whether we’re to have a cold winter or a repeat of last year’s dreary murk. In the cities, where roads are well gritted, gas mains reach every household and there are hundreds of corner shops and supermarkets to hop into when the milk runs out, a blast of snow in early November might have seemed like reassurance that climate change hasn’t had the last laugh – at least yet. Out here in the Dale, a deep freeze would be somewhat more inconvenient. Either way, whatever winter throws at us we’ll need to be prepared. In this year of upheavals in the national and international political climate it can be tempting to take on the uncertainty of the world in our lives, by putting off decisions perhaps, tightening our belts and focussing in on our own immediate concerns. I know that can happen in my case anyway. But turning inward doesn’t stop the problems of the world from building up. A few days after the Charlie Hebdo massacre nearly two years ago I was reviewing papers on a breakfast radio show. Pressed by the presenter for some kind of response I reached for the nearest cliché, saying that at these times instead of turning away in suspicion from people we think we have little in common with we need to reach out to exactly those people. It wasn’t especially profound but it was said as much to myself as to the listeners. Those people are the newcomers, people in other ethnic or cultural groups, people in our workplaces we thought we didn’t like, the side of the family we don’t see any more, neighbours with alternative political views, refugees… Looking people in the eye and thinking ‘you’re as valuable as me, and what hurts you hurts me’ can be challenging when we’ve our own worries; but it’s what makes communities and society at large work. If only we could manage that at a global level too we might start looking for and really committing to the solutions to economic degradation, extremism, environmental destruction and climate change. Writing this in mid-December I could hardly blame readers from wondering why I haven’t explicitly mentioned Christmas yet – in fact at this point you might be forgiven for imagining saying ‘bah humbug!’ But perhaps I have been talking about just that… Experienced by probably the majority in this country as a time for families to draw in together, huddling round a hearth or its modern equivalent, the 42” TV, the message of the Christian Christmas is at least in part almost the exact opposite of that cosy vision. It’s a message that I’m reminded of whenever I greet visitors to the Meeting House or Barn. It’s that the outsider sometimes holds something far more valuable than we can supply on our own or from our innermost circle: the invitation to look outwards and upwards to the wider world, to sound the depths of our humanity and realise the potential for human communities when all people are included. Now that’s something really worth preparing for, winter or summer. 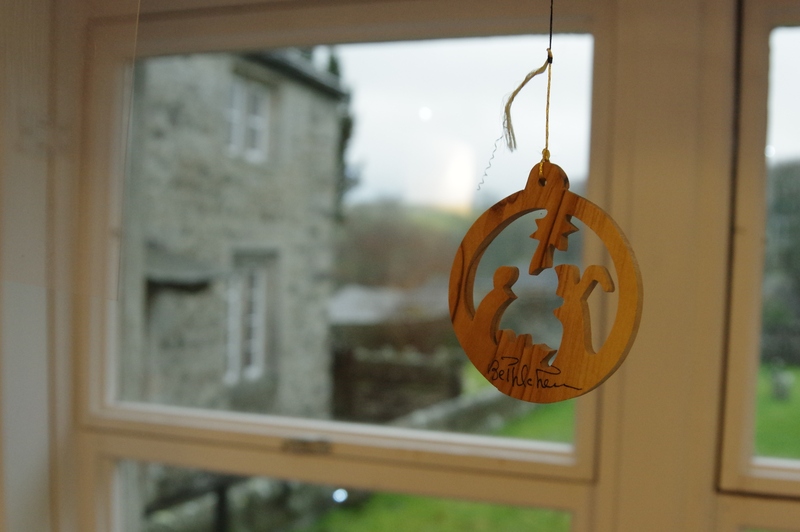 Quakers may not mark Christmas in their worship but as individuals we do join in with the seasonal fun & festivities… so if you’re reading this in December, have a very happy and restorative Christmas – and we’ll look forward to seeing you in 2017! It was the morning stroll that turned into a day-long ramble. 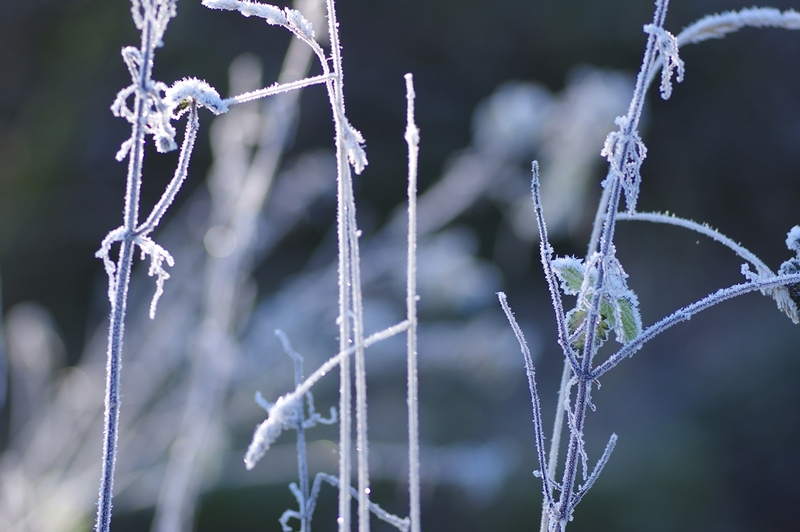 Intrigued to discover the secrets laid by the night’s frost, I set out with camera to the riverside, snapping rime covered seed heads and fronds of fern, swapping lenses between close-ups and landscapes with frigid fingers unused to the sudden cold. The magical beauty is unsurprising to anyone who has seen ice before; what draws me on are the striking patterns of ebb and flow on the hillside opposite. Parallel rises and falls strafing the surface of the ground, these ‘lynchets’ were caused by the transverse ploughing of a slope by a single farmer, unlike the multiple parallel land holdings indicative of ‘ridge and furrow’ elsewhere. Now in the relief of light and shade thrown by the low sun on the frozen earth, the sculpted hillside tells its history more clearly than in any other kind of weather. Exploring these undulating fields rising east of the river leads to the hamlet of Calton and a decision point: do I turn clockwise back home for elevenses and to get on with the day or make a longer loop anti-clockwise to see what lies beyond? There’s an enticing high point on the map not far away and the views on a clear late autumn day would be stunning… There is no contest, so I turn north-eastwards to the bridleway up to Weet’s top. It’s not long before the decision is vindicated. Rising above the tree line not far from Calton, the view opens out to envelop most of Malhamdale, the grizzled southern edge of the Dales and the Aire valley around Skipton, reaching beyond to the hills of West Yorkshire, south-west to the magnificent gritstone plateau of Pendle Hill and west to the rolling horizon of Bowland in Lancashire. This skyline is familiar but what is breath-taking today is the spectacular temperature inversion that has spread mist like white butter on the valley floors, punctuated only in the foreground by tree tops and rises, so that the landscape unfurls below like the dishevelled humps of an unmade patterned duvet. 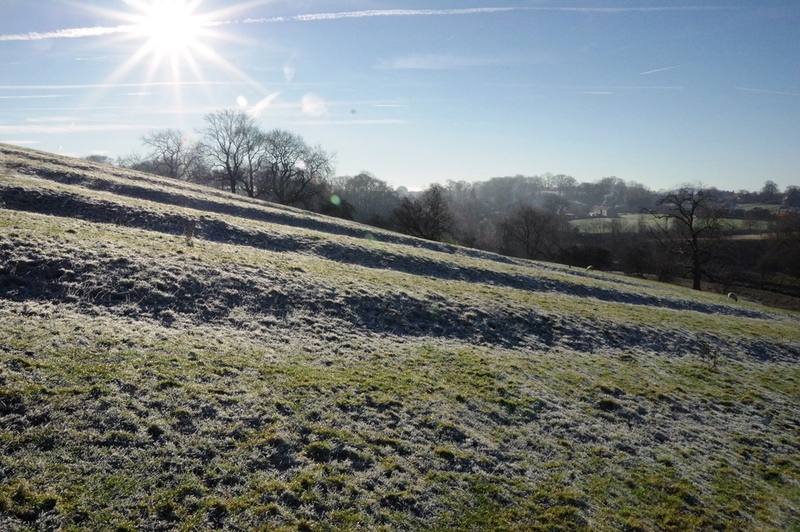 From here upwards there is little shelter, so that the sun has thawed most of the frosted ground; but in places walking alongside minor ridges I find my right foot connecting with hard, frozen ground while my left lands on soft, sun-soaked earth. 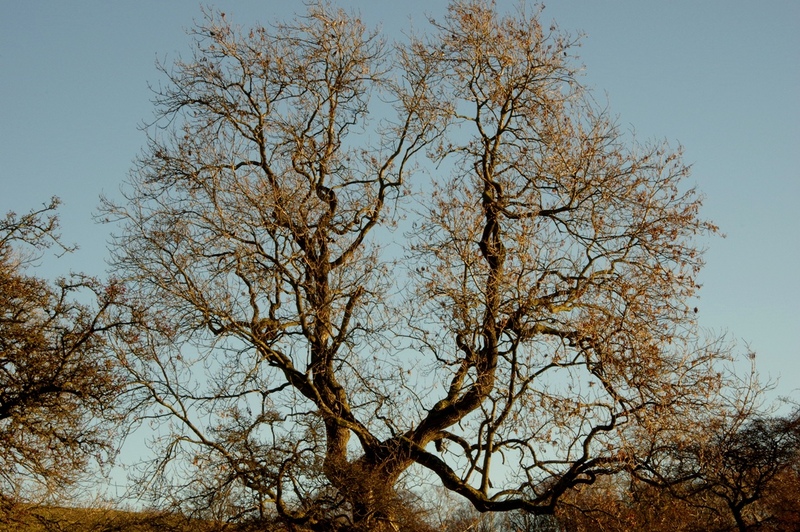 It’s the line between autumn and a winter that’s all too eager to establish itself here by late November – perhaps the reason why I meet so few walkers on what is a perfect day to be out on the hill. 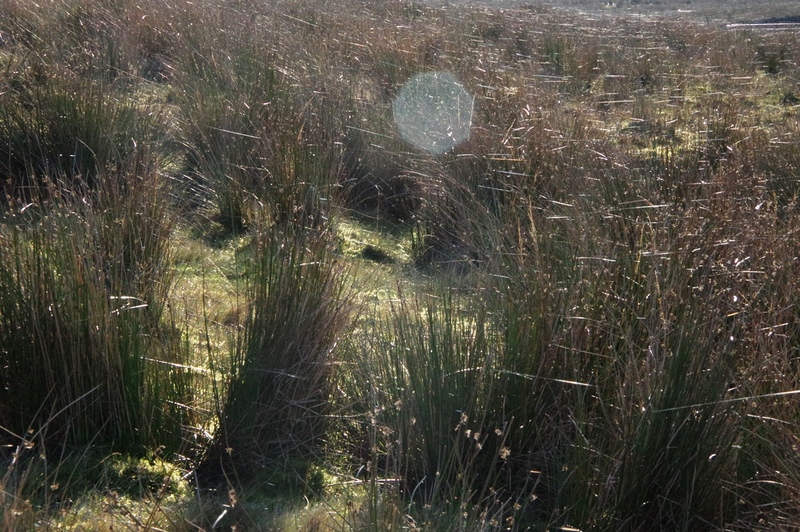 The path to Weet’s Top is long and straight, rising gradually and easily across the rush-flecked moor. It’s such an inconspicuous peak that unless it were marked by a trig point I might have walked on past. But it’s the highest point for some distance, giving a panoramic view of the southern Dales and the farther peaks and troughs of the region. 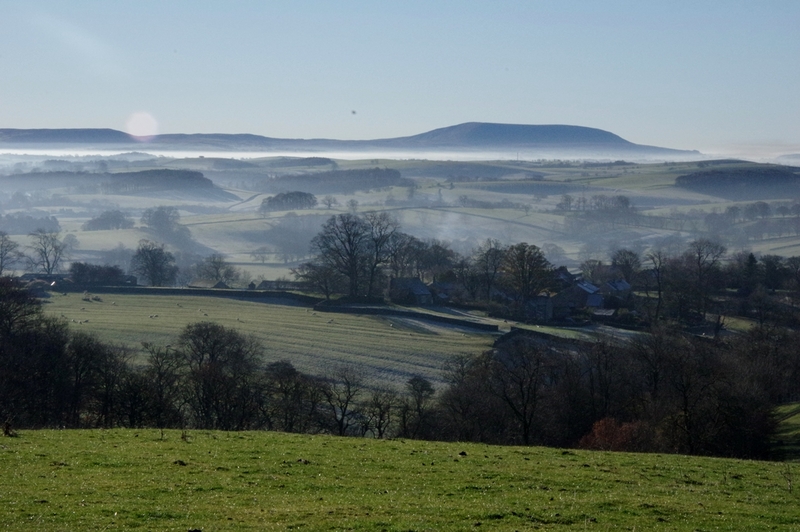 Pendle Hill is an ever-present companion on this walk and it’s easy to understand how it caught the imagination of early Quakers as a place inspiring vision and far-sightedness. Other peaks have no less character, each uniquely contributing to a visual feast: Flasby Fell to the south with its jagged ridge line; Thorpe Fell, south-east, with a war memorial marking its summit; the impressive snow-covered flank of Great Whernside closing the view north-west and the grit-strewn slops of Hawksmill Clowder closer to hand in the north to name a few. On a day that began in the frigid belly of the wintry dale it would be reasonable to expect this exposed spot to be impossibly uninviting; but the sun is strong enough here well above the misted valley to have warmed the still air sufficiently that I’ve been obliged to pack up my outer layers, only replacing my pullover after a brief lunch stop. I retrace some of my steps, hiving off to the right to make a loop of this increasingly extended morning stroll. Up on the moor, away from most boundaries and waymarker posts it’s easy to misjudge one’s direction by a degree or two; I manage to find myself on the wrong side of a steeply sloped gill but notice soon enough to avoid too much of a detour. Veering too far right again it’s on turning back towards the sun that possibly the most exquisite sight so far is revealed: a field of gossamer stretched between the blades of rushes twinkles, vacillating in the light breeze caressing the hillside, its million tiny authors blown away to make their spidery fortunes somewhere else. I soon find the track leading down to Hanlith and before long have to replace coat and scarf – the temperature inversion having held all day, it seems as though the air cools by a degree with every step. At the bottom I’m contemplating whether to stop for tea and cake at the Town Head Café in Airton when I slip, not on ice but mud – a reminder that it’s still not quite as cold as it might be in a week or three. There’s one more delight in store before I get to clean up though. Following a group of three gents with some serious looking binoculars I catch them up at the riverside near Airton where they’ve stopped, looking intently at the trees in the near distance. When asked what’s piqued their interest, they reply ‘the Fieldfares’. 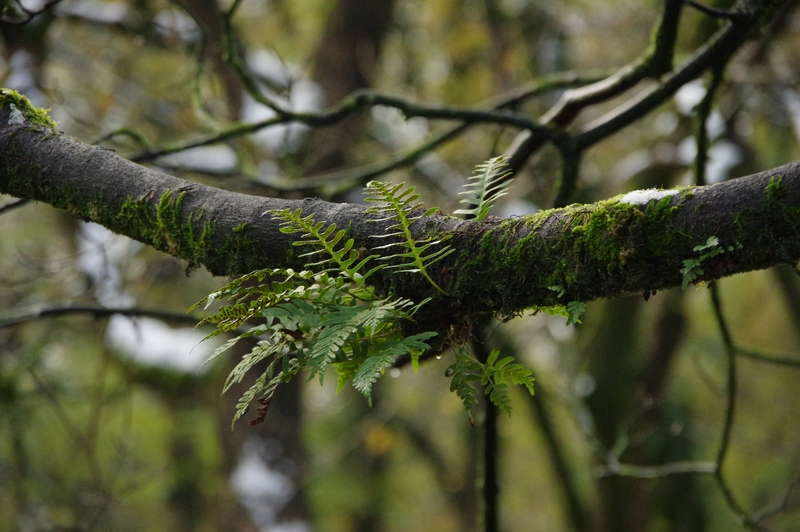 Sure enough, hundreds, perhaps thousands of small birds that my untrained eye might have taken for Thrushes are decorating the nearby tree-tops, periodically flitting from one tree to another. Unlike Starlings who appear to act as one organism pulsating in the sky at dusk, these white-bellied birds alight from the trees one by one, the whole troupe unpeeling chaotically from each tree, landing, then moving on soon after in a delicate dance that flecks the air like glitter in a snow globe. Deep in thoughts of hot tea, setting the fireplace and sifting through the photos of the day, I might well have missed this, the last and best sight of the day! Mid-autumn and nature is ratcheting up the splendour by providing a rare flourish of snow, bringing new contrast to an already colour saturated landscape. Malhamdale really knows how to put on a show. A friend’s visit makes a perfect excuse to explore this rapidly changing scenery. 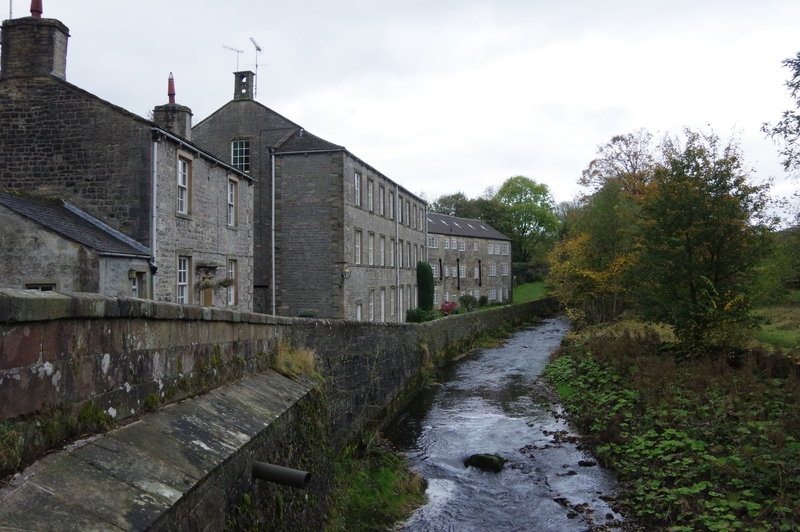 We head up river from Airton along the Pennine Way, feet soon squelching in half-thawed puddles, eyes fixed on the hills above Malham trying to make out where the line is between white earth and white sky, with only flecks and shadows to distinguish subtly textured hillside from cloud. 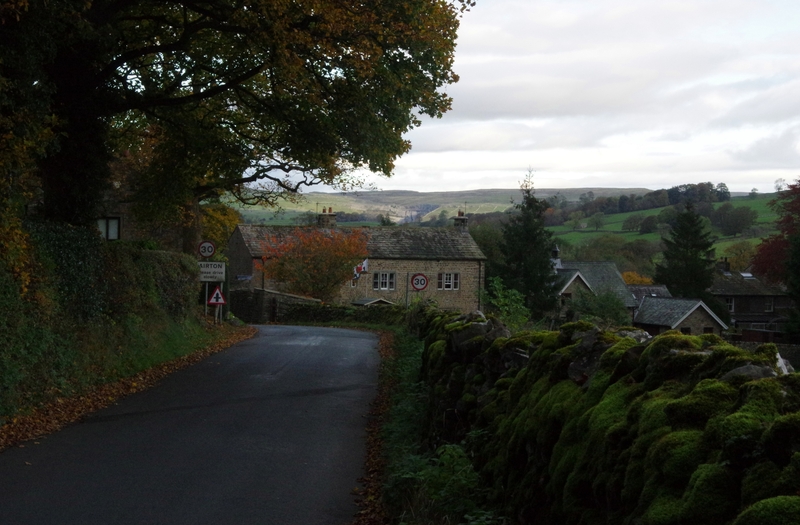 Soon, arriving at Mires Barn, we hive off north-eastwards along the paved footpath hugging Gordale Beck. As the valley narrows, becoming a steeply sloped gorge, woodland closes round and the air stills. It’s a cliché, but there’s definitely a magical feel to the space under a tree canopy, with or without leaves tinging the daylight green. The little gorge has the added ingredient of what appears at first sight a highly mysterious feature in the shape of Janet’s Foss. This waterfall slides over what looks to be an outpouring of surplus concrete but is in fact an entirely natural agglomeration of limestone, in effect an outdoors stalactite, formed over millennia as the lime-laden beck tumbled over the moss hanging from the natural cliff edge left by the retreating glaciers. The resulting limestone wall hides a chamber, open at one side, once thought to be the home of Jennet, queen of the fairies. Emerging into open space again, our next destination is Gordale Scar, a twisting cul-del-sac of an imposing, high-sided rocky gorge ending in a chain of waterfalls beneath overhanging cliff faces. Were it not for the paved route in, this would seem an entirely uncompromising landscape – the end of the earth. Rocks strew the ground, topped with miniature snow peaks, echoing the striated hillsides above to which trees cling crazily. The only sounds reverberating around the precipitous slopes are the cawing of ravens and the thrashing of water on stone. After a respectful few minutes we’re sufficiently humbled and exit the way we came, leaving the spirit of the place to its own thoughts. 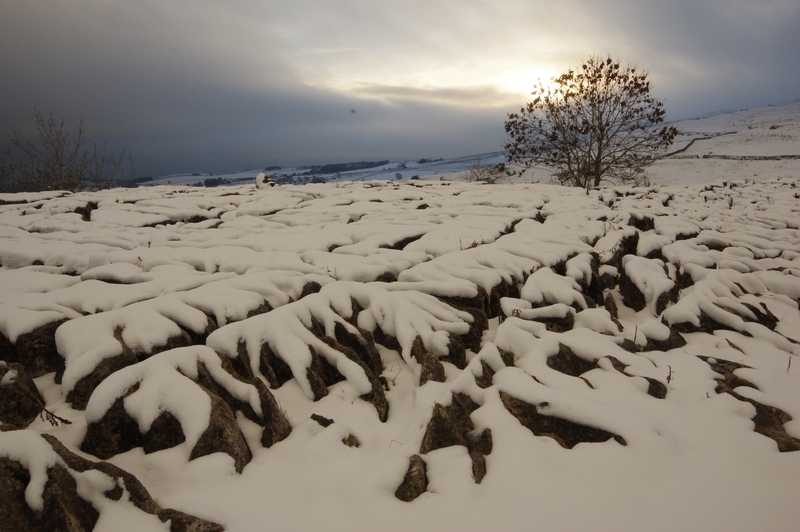 The wind has whipped the snow onto the north and eastern faces of the drystone walls, betraying its origin and the reason behind this cold snap. Skirting the hillside past Grey Gill the view seems almost entirely wintry, save for a few reddish brown trees around Gordale Beck; but as we climb towards the hills above Malham Cove, a contrast develops between our snowy surroundings and the far greener, darker reaches of Malhamdale in the distance. 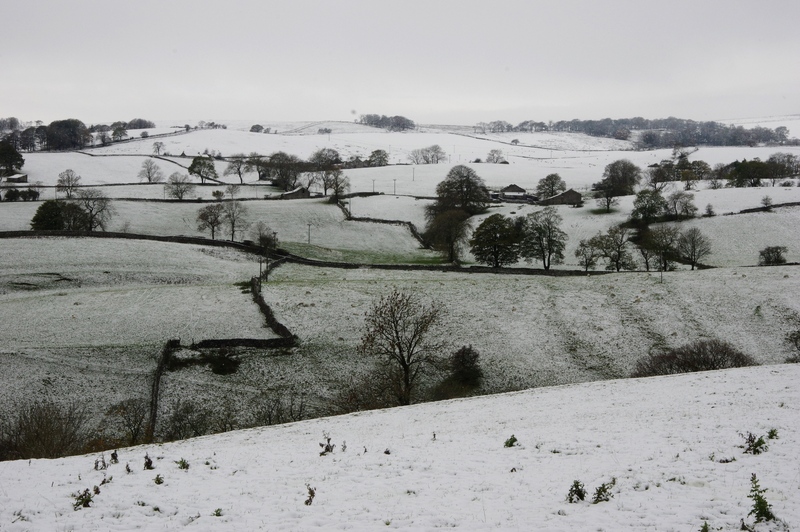 Snow-dusted fields we marched across earlier in the walk appear verdant from up here. 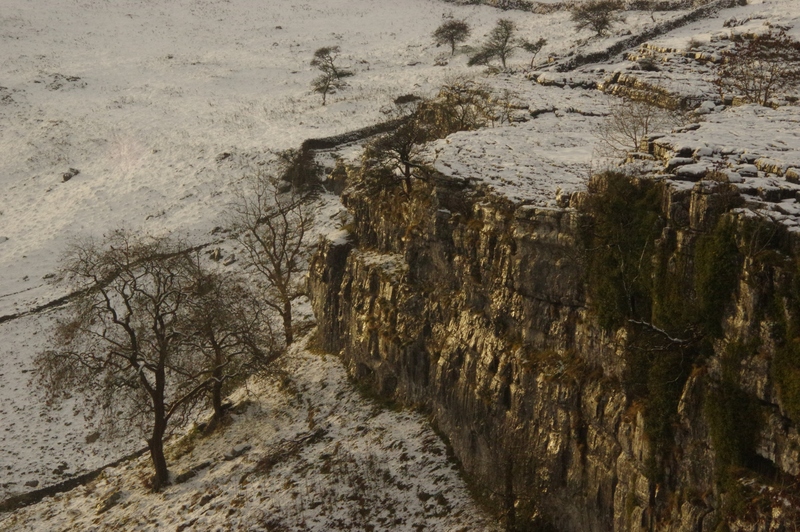 The deep grey sky over the south and west is a warning that the light will soon fade and we should complete our circuit of Malham Cove before too long. Up here the landscape has been simplified by the snow to a high contrast light and dark; a line drawing highlighting only the essential counterpoint of topography, walls, rocky outcrops and occasional trees. Then the light does something very special: the face of Malham Cove has come into view below just as the sun leans towards the horizon, turning the grizzled precipice into a crinkled cloth of gold. It’s a moment that would made this whole walk worthwhile but is only one of many in what has been a uniquely enchanting day. Yet there is more to come. The limestone pavement above the cove is treacherous underfoot in the best of weathers, so we pick our way around the less pitted area to the rear to avoid twisted ankles and sprained wrists. Even so, the greatest of care is required, the snow having disguised the undulations underfoot. It seems we’re not the only wanderers to brave it today, tentative footprints giving clues to safe routes. Sturdy boots are an essential tool and I would enjoy this more I feel with the aid of a walker’s pole. None of this takes away, however, from the astounding view, and the sense of being at the edge between two worlds: the wild and the tame, the ancient and the contemporary, the snow-bound wilderness and the sheltered valley where life is still possible. And it’s to that valley we now return, navigating the steps west of the cove to its foot. After taking a detour to see the Malham Beck gushing from the letter-box opening at the base of the cliff, we begin the long trek back along the road. It’s only quarter to four but rumours of night are gathering and by the time we trudge foot-sore into Airton, the dark and the chill have settled and the fire and hearth are as welcome a destination as were the extraordinary places we encountered today. 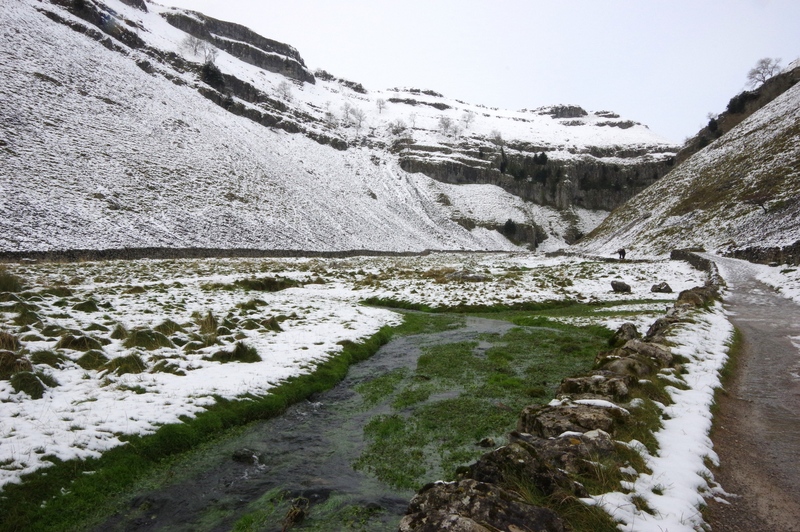 This entry was posted in outdoors and tagged autumn, Gordale Scar, Janet's Foss, Malhamdale, snow, walking. The Dales have been familiar to me since childhood as a place of adventurous day trips with my Yorkshire grandparents (based near Barnsley) and escapes with rambling groups whilst at university in York. But although I always thought I would eventually move to Yorkshire, I imagined the move as a sideways step from my home city of Coventry into one of the region’s metropolises – not through any particular love of cities but because that’s what I knew and because statistically speaking, the chances of a ‘Volunteer Resident Friend’ (VRF) position coming up in a small village in the heart of the landscape I’d grown up captivated by is much less likely than finding a job in Leeds or Sheffield. I’m completely thrilled to be here. Never mind that I’ll miss countless friends, my small suburban garden, the amateur orchestra that until last week I conducted, the choir of Holy Trinity in which I sang Bass, Coventry Quaker Meeting, the community farm at Ryton Organic Gardens from which I collected fresh vegetables every week, etc. Coventry was good to me but I know already that life in Malhamdale will be just as rich. Drop in at Airton Barn soon! This entry was posted in meeting house, quakers, venue.